v1.2 Find good questions to answer. hiding them by score, views, user reputation and accepted answers. It only runs on pages where questions are being listed: Homepage, Unanswered and Questions. Depending on the page and the configuration, very few questions will show up, and chances are good that they are interesting. If somebody already gave a negative vote, why look at it? If it's a new user, sorry to say, but very few write a good question or display research skills. Anyway, this is a tool focused on Power Answerers, who already saw too much. ♦ The diamond icon was on the very stack sprite. Adjust the votes, views and reputation thresholds, select if questions with accepted answers should be hidden, enable the filter and save. To disable, just uncheck the Enable filter option and save. For now, the script is only compatible with Chrome. A browser extension for managing user scripts is required, like Tampermonkey or other similar extensions. After installing the extension, clicking the "download / install" button below should bring up a dialog asking if you want to install the script. Unfortunately, I couldn't manage to make the sliders work on Firefox. I'm by no means an expert on userscripts, all contributions and forks are welcome. - Version 1.2 - Code revision. Better handling of the Unanswered page. New indicator counting hidden/total. 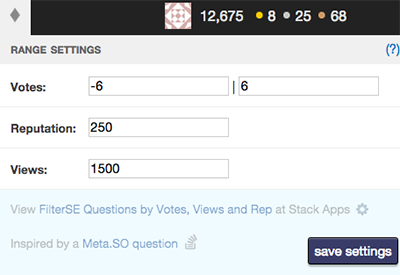 - Version 1.1 - Now, questions are hidden/shown in response to the slider values. - Version 1.0.1 - Bug fix, page detection must be earlier. - Version 1.0 - Added views. UI upgrade. Custom ranges settings. Localstorage is now used instead of cookies. - Version 0.4 - Detect if user is mod and use different icon. Expanded range of selection (votes -6/6 and rep 0/250). 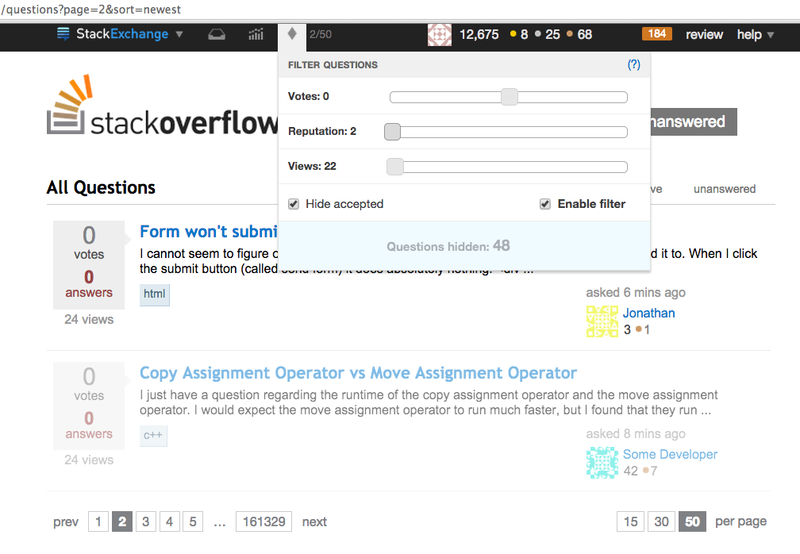 - Version 0.3 - Changed script name, it's not exclusive for Stack Overflow anymore. Added /unanswered tab. More information about the filtering status on the button's tooltip. - Version 0.2 - Support for all sites added. - Version 0.1 - Script launch. Support /unanswered tab as well. Right now it's a global value, but I'm thinking on keeping different settings for Homepage, Questions and Unanswered pages. Reputation is irrelevant on Homepage and Unanswered, as the user that's shown is the last editor, not the OP. The views count changes a lot depending on the actual page. Is it worthy to have different settings for each page? Thoughts? Not the answer you're looking for? Browse other questions tagged script questions tampermonkey .